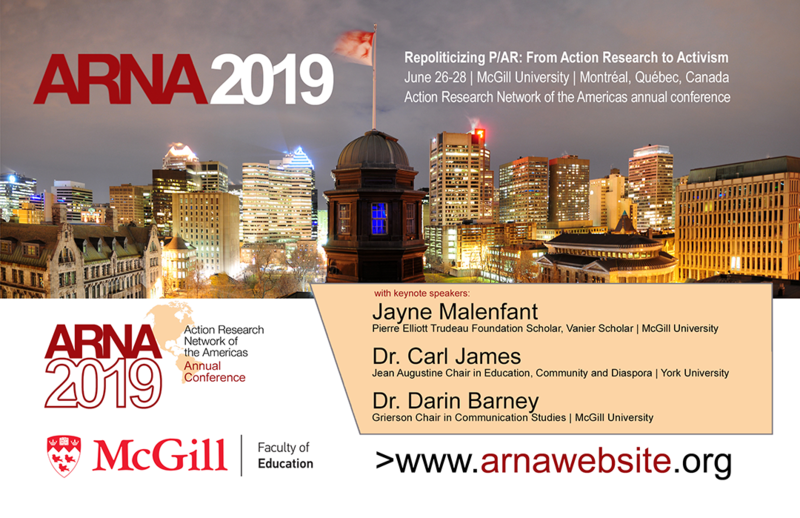 ARNA 2019 will take place in Montreal, Quebec, Canada over June 26-28th. The conference will be held at McGill University's Faculty of Education, located in downtown Montreal. The theme we have chosen for the conference is Repoliticizing P/AR: From Action Research to Activism. La Conferencia ARNA 2019 “Re-politizando la IAP: De la Investigación-Acción al activismo” estimulará el pensamiento crítico y generará discusión intencional sobre las futuras direcciones de los enfoques de la Investigación-Acción Participativa, en una era de globalización neoliberal, caracterizada por la agitación social y política, así como por la austeridad económica. La conférence annuelle 2019 ARNA, Repolitiser RA/P: De recherche action à l’activisme, stimulerait la pensée critique et encouragerait les délibérations réfléchies sur le sujet de l’avenir des approches participatives et de recherche d’action, particulièrement dans une ère néolibérale et mondialisée caractérisée par des bouleversements sociaux et politiques et une austérité économique. The 2019 ARNA Conference, Repoliticizing P/AR: From Action Research to Activism, will stimulate critical thought and generate intentional deliberation on the future directions of Participatory and Action Research approaches in an era of neoliberal globalization, characterised by social and political upheaval and economic austerity. Proposal submission: October 2018-April 1st, 2019. The 2019 ARNA organizing committee have chosen the theme of Repoliticizing P/AR. It is hoped that this will generate debate, discussion and deliberation on the future directions of P/AR in an era of neoliberal globalization characterized by social and political upheaval, and economic austerity. While neoliberalism can be viewed as a primarily economic philosophy in which free markets are the centre-piece, implicit within it is also a system of governmentality whose locus is the individual consumer, rather than the citizen, as was the case in post-war social democracy. The transition from the politics of citizen rights to one where everyday life is organized through consumers and market relations has fundamentally decontextualized the discourse of participatory democracy. Unsurprisingly, the prevalent discourses of participation that define contemporary approaches to P/AR and participatory research are also being increasingly infiltrated and appropriated by neoliberal discourses and politics that has resulted in the commodification of increasing areas of everyday life that were formerly part of the public domain (education, healthcare, social services, environmental protection). The 2019 conference will, therefore, continue discussion and debate initiated at the 2018 conference on Knowledge Mobilization for Equitable and Peaceful Social Progress by exploring questions connected to the democratization of knowledge production. It will also seek to provoke discussion and debate on doing P/AR in an era where research is progressively being harnessed by governments and public institutions to imperatives defined by neoliberal and neoconservative policies and discourses. In particular, it will aim to explore forms of P/AR that contest, challenge and/or subvert this ideological drift apparent in recent decades.